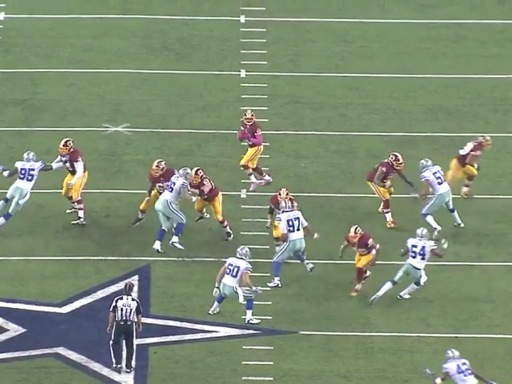 Here we see Hatcher using a swim move to over Lichtensteiger to get into the Redskins backfield in a hurry. 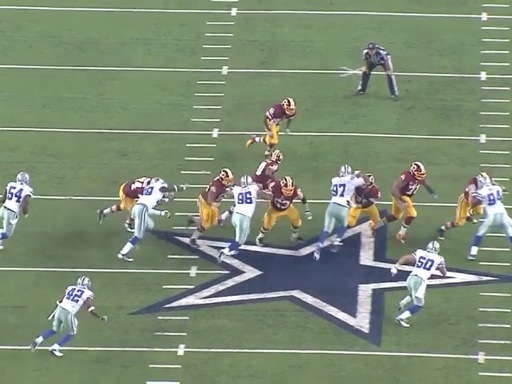 Lichtensteiger barely has a chance to get his hands on Hatcher and Hatcher is already rifling past him. Now, the interesting thing here is that Hatcher is coming in on his left side, but this running play is going to his right, but because he has such good leverage on Lichtensteiger he is still in great position to make the stop on Alfred Morris. 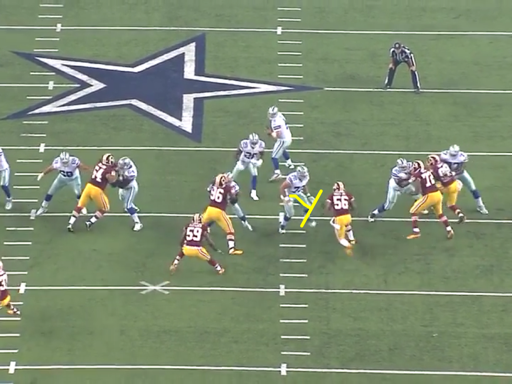 Some defensive tackles might have gotten run out of this play, but not Jason Hatcher. 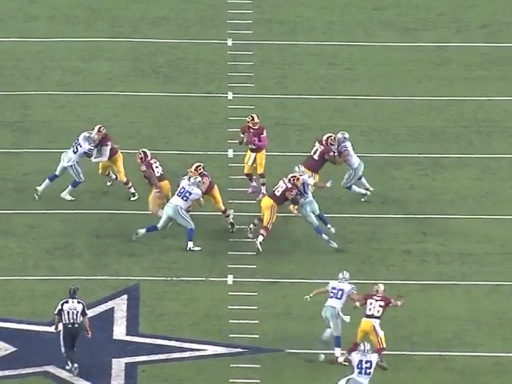 Hatcher never gives up on the play and is athletic enough to stretch out and make the tackle on Morris. The result is a stop four yards behind the line of scrimmage. On this play Hatcher delays on the line of scrimmage, but only needs one very nifty move to beat his single block by, you guessed it, Kory Lichtensteiger. Hatcher is face to face with Lichtensteiger and uses several slaps to both of the guard’s arms to provide the moments hesitation Hatcher needs to proceed to shoot past his man. Now, if this were most quarterbacks, the result of this play would have been a devastating sack right in the middle of the pocket, but since this is Robert Griffin III he is able to elude Hatcher’s first attempt to bring him down. 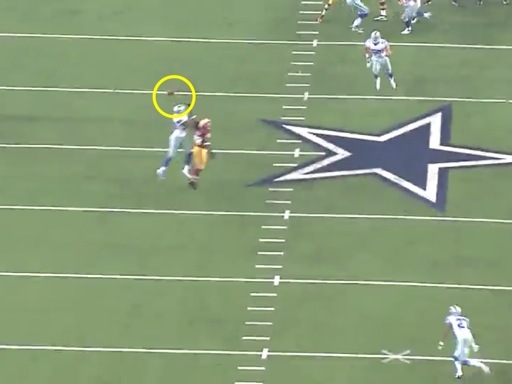 However, Hatcher does not give up on the play and is able to chase down RG3 and sack him for a ten-yard loss. 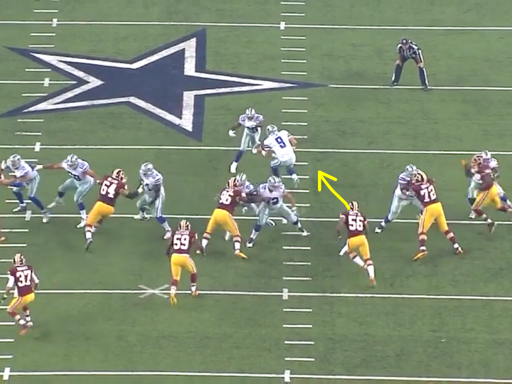 Jason Hatcher was the best player on the field Sunday night, and is building an All-Pro resume for the 2013 season. On a defense with well-known superstars like DeMarcus Ware and Sean Lee, Hatcher is outplaying all of them. Pierre Garçon is Griffin’s primary read on this play and the opportunity is there for Garçon not only to make a clean catch, but also run for a larger gain in the middle of the field. Unfortunately, Griffin makes a terrible throw and puts the ball behind both the receiver and the cornerback. 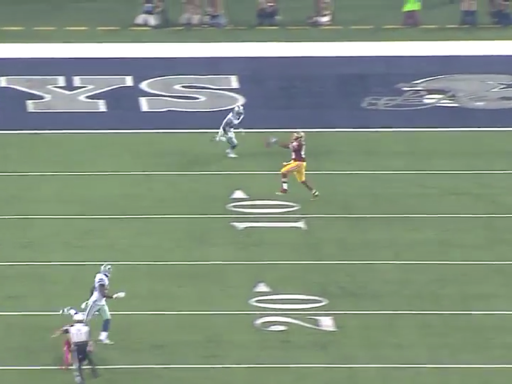 If Griffin leads Garçon with this pass, the Redskins have at least a first down, and the potential for a lot more. It is inaccurate throws that lead missed opportunities like this that at least leaves the door open for questioning whether Griffin can ever succeed in a traditional NFL offense as a pocket passer. Perhaps it is still something with the knee, and granted he did miss all of the crucial second offseason of practice, but Griffin’s poor accuracy is disturbing to say the least. Most young offensive lineman would stick with original down lineman, Barry Cofield, even though Brian Waters already has him blocked. However, Fredrick is aware enough on the play to realize Perry Riley will be coming free on a blitz. Romo’s back is turned to Riley since he is in the middle of executing a play action fake, and by the time he is done there, Riley would already be on him. That is, if it were not for Travis Fredrick. Fredrick not only has the awareness to recognize the blitz, but also the short area quickness to get over and successfully block Riley. Pressure right up the middle from a free blitzing linebacker is the absolute worst for quarterbacks to deal with, but here, Romo was spared from that by his impressive rookie center. There is a clear avenue for Morris to run free into the secondary for a big gain. Everyone has their blocks and all Morris needs to do is turn on the jets and accelerate through the avenue provided. Instead a defensive end, he should easily be able to outrun, catches Morris from behind. If this were an elite back with superior burst and acceleration, this could be a potential chunk yardage run instead of a mere five-yard gain. 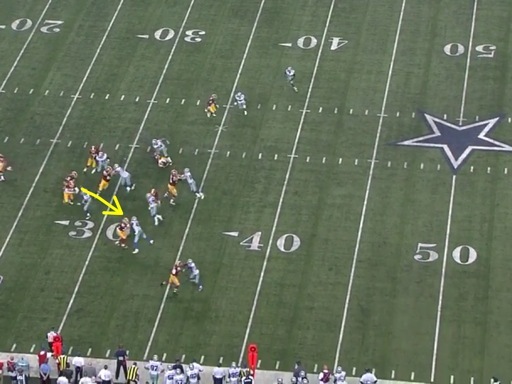 A lot of Redskins fans want to know why Roy Helu sees the field. It is because Morris also offers very little in the passing game with only fourteen career receptions. When Morris is on the field the defense is able to pretty easily assume that he presents no threat as a pass catcher, and that assumption is generally correct. On this play, once again, if this was another running back the Redskins could have a potential touchdown on their hands with only one defender between Morris and the end zone. However, Morris drops the ball in the open field and never gets the opportunity to break the tackle of rookie safety J.J. Wilcox. The Redskins do not need to move on from Alfred Morris or anything, but it would be a mistake to crown him as a special running back in this league; there is a reason he was available to them in the sixth round. He can still be a valuable piece for them if everything else is going just right around him, but the Redskins should probably use up Morris for the duration of his rookie contract and let him walk away if he values himself into an unreasonable price range. It is easy to make excuses about the offensive line’s blocking and the lack of the read option, but the eye in the sky does not lie, and it shows Alfred Morris is a very ordinary player. The Redskins may have found a valuable contributor in their third round rookie tight end. Jordan Reed is a small but athletic move tight end, who has been impressing for this team. On film, Reed shows plenty of ability to get open against linebackers and safeties and a knack for finding the open spaces in zone coverage. He also has the body type and moves to gather some yardage after the catch. Reed also showed a surprising ability to hold his blocks for a player his size, something that cannot be overvalued in a run heavy offense like the one in Washington. Reed draws comparisons to another smaller, athletic former Florida Gators tight end who is currently in prison, but while he is not nearly the player or specimen that guy is, Reed can play a similar sort of role for Washington. This offense is clearly starving for reliable playmakers and he can provide one in the middle of the field for his struggling quarterback. As Fred Davis rightfully fades into the background, there is no reason Jordan Reed should not continue to log more snaps in this offense.